An idea that’s pretty popular among sales people and growth engineers is considering the journey your customers take toward their eventual purchase (or non-purchase) in terms of a funnel. Here’s an article that’s a good starting point to thinking about sales funnels. Using the metaphor of a funnel , along with modern analytics and tracking software, allows us to think of the sales process as a precise thing: between Page One and Page Two we lose about 30% of our traffic, from Page Two to Page Three we lose another 40%, and then about 5% of the original folks from Page One tend to make a purchase. The Big Idea of a sales funnel is to make that final number, the final group of folks who make a purchase, as large as possible. We can take this idea of a funnel and apply it to providing support to our customers as well, with an interesting twist; rather than the final count being our paying customers, we want to consider the final count as the folks who open a support request. In this way we flip the sales funnel on its head – rather than maximizing our final number, in support, we want to minimize this number. Our goal, as folks who provide hospitality (and service!) 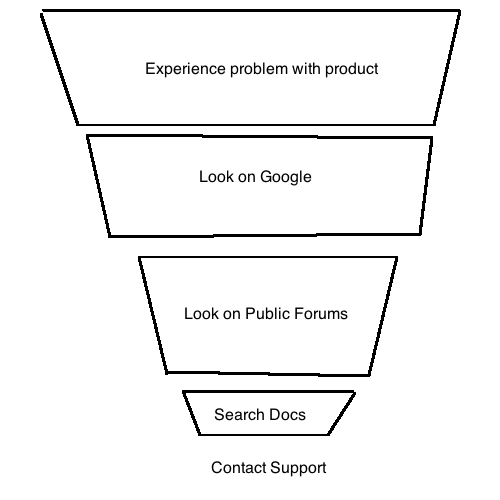 for technology products, is to enable our customers to leave this funnel as early as possible. I am of the opinion that every customer who contacts support has already experienced two failures on our behalf: the product fails to fulfill some expectation that the customer has (it is just as much our job to set reasonable expectations as it is to make products easy to use), and then that problem is not easily solved with the tools we make freely available. That means that for every customer who reaches the last step, Contacting Support, we’re already on our third strike. It’s our last chance to provide them a truly excellent experience. If we start to co-opt the skills that our growth engineer brothers and sisters are becoming so good at, we can use those same skills to help our customers escape this funnel earlier and earlier: we do the job of hospitality the best when our customers never need us at all. This is the value of a good support funnel – it keeps us down to one strike, and that’s a win for everyone.